Cassie's Stories | Stories, poems, travel tales, photography and more! Day 2: Sunday 16th July. It was sunny, so we used this day to relax on the beach. We didn&apos;t want to travel far, so walked to la Malagueta beach, which was just near the port. There were some cruise ships docked at the port, so there was quite a bit of noise from there! Day 4: Tuesday 18th July. We had a much nicer day trip today. We went on a trip to Ronda, where part of the town is built the other side of a steep gorge, and it&apos;s surrounded by beautiful countryside. We wandered around, took pictures by the famous bridge from one side of the gorge to the other and enjoyed the views. Day 5: Wednesday 19th July. Today we went to the Picasso museum in Malaga. We also went souvenir shopping and visited the Roman amphitheatre. We then got the bus to Granada, which would be our next place to stay. We wandered around that evening and enjoyed the stunning view of the Alhambra. We also looked in the little shops, filled with Moroccan-style souvenirs. Day 6: Thursday 20th July. Today we spent the whole day wandering around La Alhambra and the Generalife. It was wonderful to see the tiled mosaics, intricate architecture and the pretty gardens. Day 7: Friday 21st July. After a morning of souvenir shopping in the "souks" and visiting a tea shop, we got the bus to Seville. On arrival, we went in search of a tapas meal and ended up eating two dinners as we were still hungry after the first one! The thing with tapas is that one restaurant will give a lot more food than another one, for the same price, so we were never sure how many little dishes to order! Day 8: Saturday 22nd July. Today we wandered around Seville cathedral. It&apos;s a huge place, with lots of interesting little chapels, gold statues, old artifacts and artwork to see. We also went up the bell tower, where you walk up ramps instead of steps, so that was fun! After looking around the cathedral, we went to visit the Plaza de Espana and the park. That didn&apos;t end up being a good idea as it was boiling hot (around 40 degrees C) so I ended up overheating and feeling sick and dizzy with sunstroke. Day 10: Monday 24th July. I felt better today after a nice rest. We looked around the royal palace in Seville in the morning. It also was originally built by the Muslim moorish rulers, before the catholic kings sent them all away. So the palace had an interesting mixture of architecture. It also had a beautiful garden! Although we had to rush through the gardens, as we needed to get a bus to the Algarve in Portugal! Our next place to stay was Portimao in Portugal, it&apos;s a little town on the coast, and I was surprised to see how touristy it was! 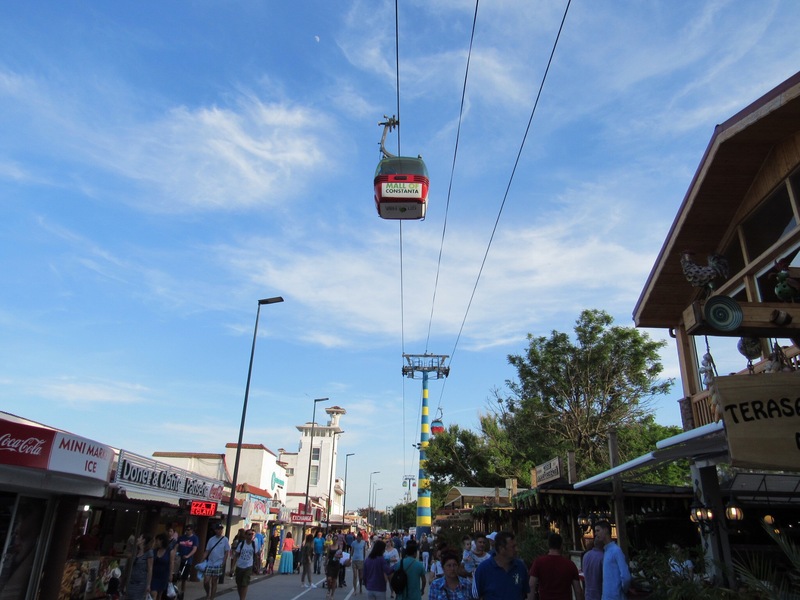 It has a line of restaurants and souvenir shops, just like Mamaia in Romania. Day 11: Tuesday 25th July. We had a lovely day of relaxing on the beach in Portimao. Our hotel was quite a long walk from the sea, but luckily they put on a bus so we didn&apos;t have to walk all of that way with all of our beach things! We had dinner near the river in Portimao, and had a Portuguese traditional meal of sardines! Day 12: Wednesday 26th July. We had another day of relaxing on the beach! The beach in Portugal is so pretty! Day 14: Friday 28th July. Today we enjoyed looking around Lisbon. We went to the castle and cathedral and took a ride on the famous number 28 tram, which goes from one side of the city to the other, past interesting sights and goes up and down steep hills, so feels a bit like a rollercoaster! Day 15: Saturday 29th July. This time we went sightseeing in Saint Jeronimo&apos;s monastery and the Belem tower. Both were architecturally stunning! They were built in a style that is unique to Portugal, called Manuelin. It&apos;s a mix of Gothic and Renaissance architecture and is very beautiful! In the evening, we went on a funicular (Lisbon is very hilly) and had dinner in a nice restaurant, where I had steak in a coffee sauce. Yes, coffee! It was amazing! Day 16: Sunday 30th July. We flew back home, on another early flight (7am this time). I then flew back to Bucharest the very next day, because I was due back at work for summer school! I hope you enjoyed reading about my crazy adventures! 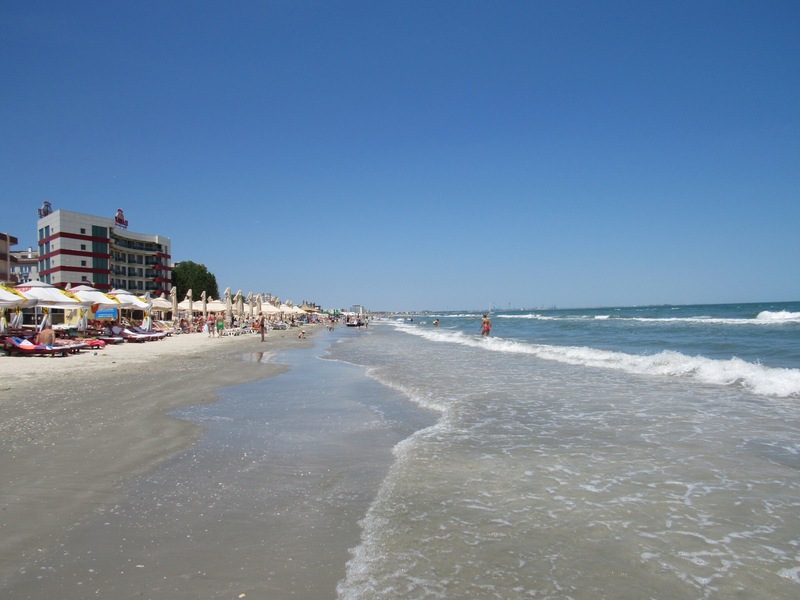 I went on a lovely little holiday this weekend to Mamaia, a seaside resort on the Black Sea near to Constanta. We had a few days off school because of some bank holidays -yay! Of course, all of Romania had those days off work, so the train was pretty full! But all the passengers seemed to disperse quite well because, although the seaside resort of Mamaia was busy, it wasn’t anywhere near as crowded as it is in the summer holidays! Many Romanians think it’s too cold to swim in the sea at the moment, and yes, the sea was chilly, but not that cold! So, I had a lovely few days relaxing on the beach, swimming in the chilly sea and wandering around. Plus, I enjoyed the sea breeze – Bucharest is so hot and humid these days, but the coast is nice and cool! My hotel was about 2km away from the main area of Mamaia where all the tourist shops, snack stands and restaurants are located, so I wandered along the beach or promenade every day to enjoy the atmosphere and eat pancakes… I also went on the cable car, to enjoy the lovely views of the sea and lake. 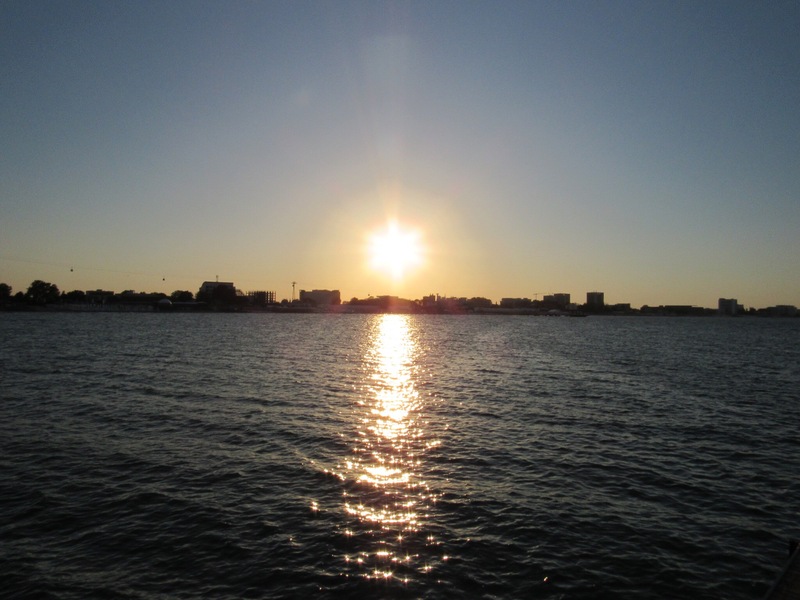 Oh, and on the pier to admire the sunset! Well, if my Romanian was better, I could have told them that it’s nice to go on holiday, to see and experience new things and enjoy a change of scenery every once in a while (plus I love the seaside!) And if your friends don’t/ can’t come with you, then it’s better to go alone than to not go at all! Who agrees? The beach near my hotel. All the tourist shops are squished into this area of Mamaia. The sunsets were lovely! This photo was taken from the pier, I didn’t need to swim with my camera to take this photo! I was thinking where to “visit” for a travel Tuesdays post, and my mind wandered to a lovely holiday I had with my family to Skiathos, a beautiful little Greek island. We went when I was about 8 – a long, long time ago! I wonder if the island has changed much since then? Of course, my memories of my holiday were of playing on the beach, poking jellyfish with sticks so that they wouldn’t sting us, burying dolls in the sand with my sister (and not being able to find one of them again) and trying to swim to China on a lilo with some other children we befriended… I do still wonder where that doll is! Perhaps someone else found her? We also went on some fun boat trips and coach tours, where I distinctly remember one lady stealing my sister’s seat! Who would steal a child’s seat on a bus? I still think that was weird! I also remember watching lightning out of the coach windows one evening, after a busy day’s coach trip. I hope you enjoyed reading my happy childhood memories! 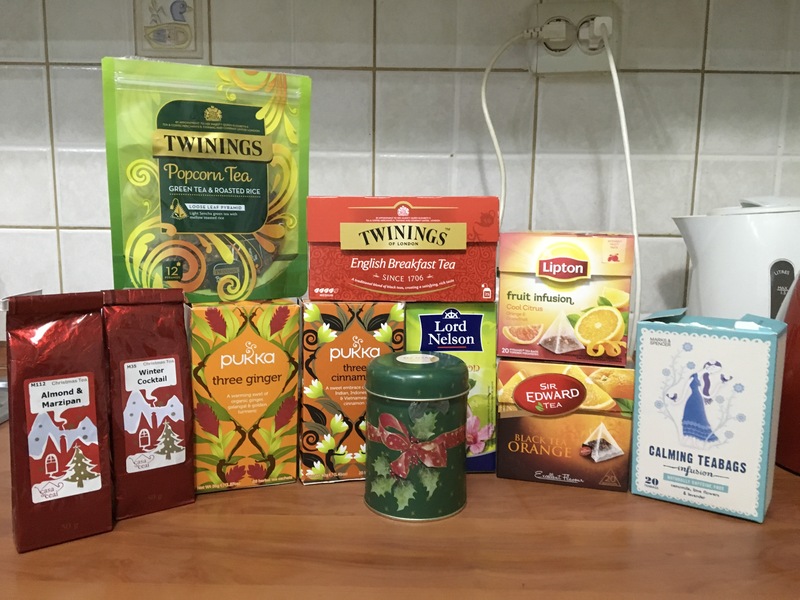 I was thinking about what to write, and decided to post this photo of my tea collection. I did have 15 or 16 boxes at one point, but then decided that I’d better finish some before buying more. 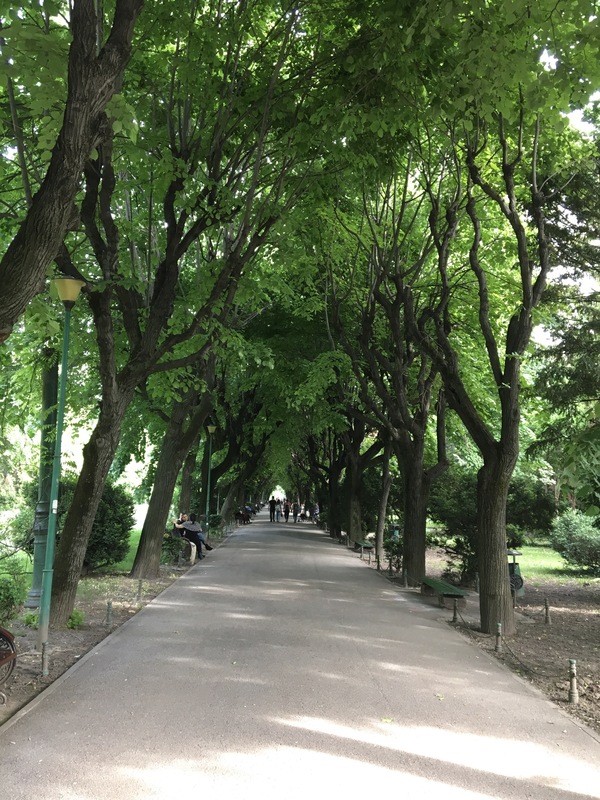 Here is a nice picture of Cismigu Gardens in Bucharest that I took on Friday after work. 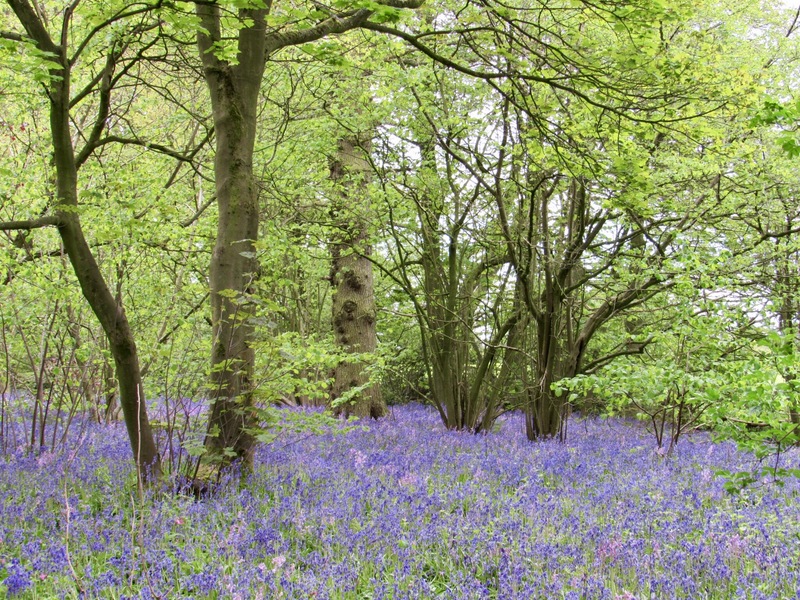 Many woods and gardens in England at this time of year are full of spectacular carpets of bluebells. Here is a photo from a little outing I had on Saturday to Rode Hall, near Congleton in Cheshire. Don’t you just love the bluebells? 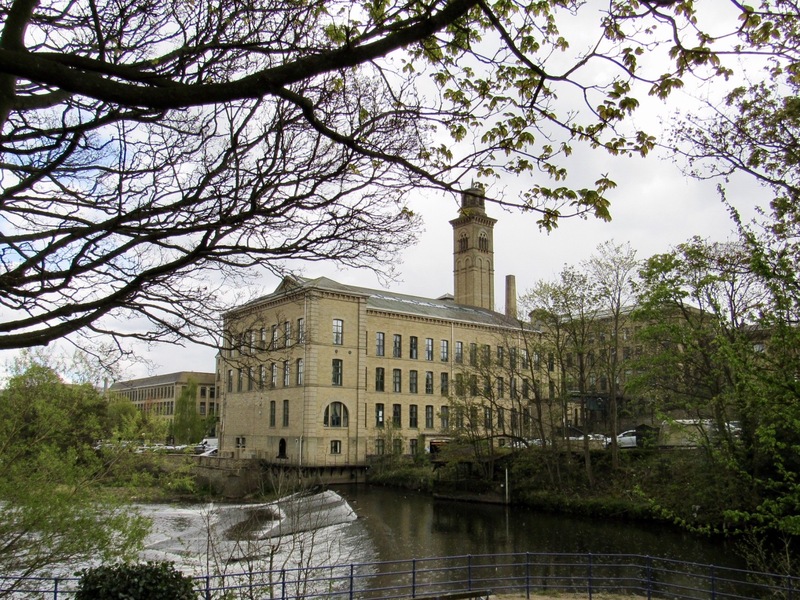 I know, it’s not Tuesday… but today I want to tell you all about my little outing to a place called Saltaire in Yorkshire. It’s a mill and village built by Sir Titus Salt in 1852 to 1859. 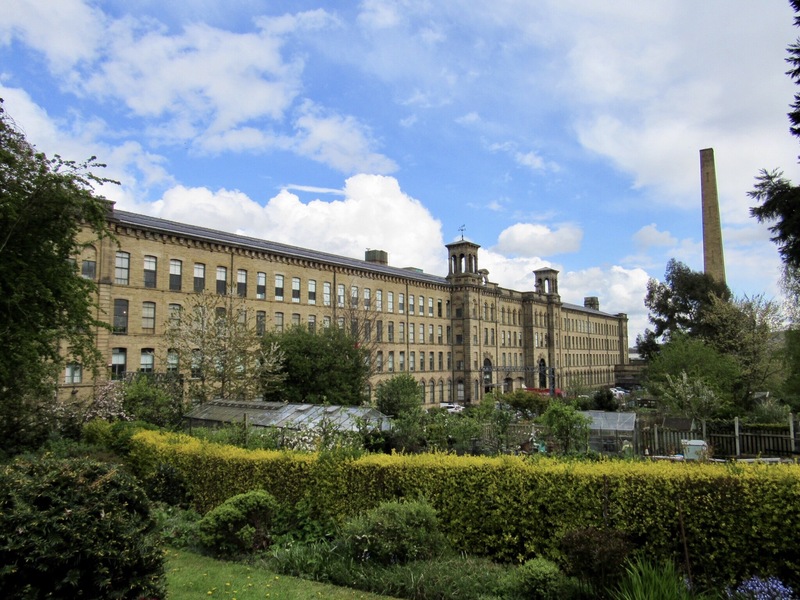 He wanted to move his workers out of the unhealthy slums of Bradford, to a place with clean air and better facilities. The mill isn’t used anymore (it’s an art gallery and shop now) but people still live in the lovely cottages. There are lots of interesting buildings to look around and plenty of trees and flowers too. Edit: Here’s an example of the exhibit in the art gallery in the old mill. 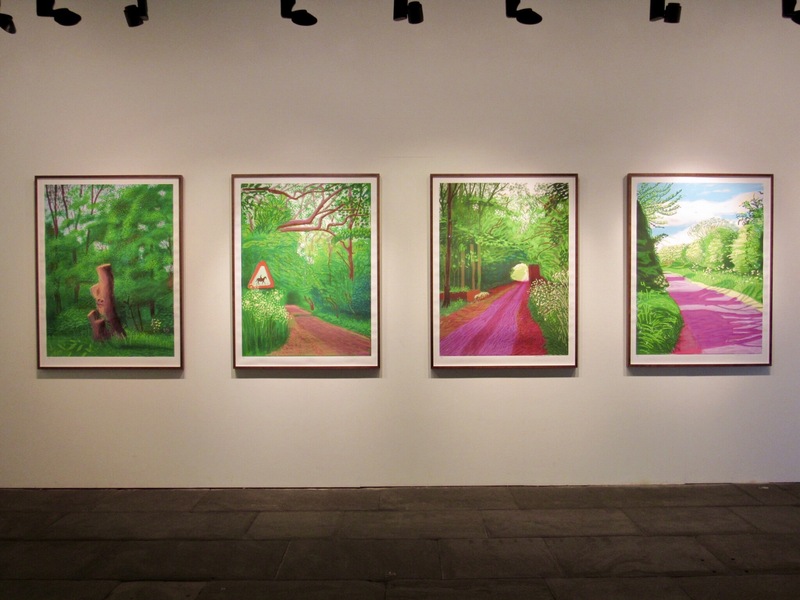 It’s a project called “The Arrival of Spring” by David Hockney. He made these pictures by drawing on his iPhone and iPad. So clever!